All Dell Outlet PCs and tablets come with same as new limited hardware warranty. All Dell Outlet purchases include FREE SHIPPING. Plus discover additional savings with Dell Outlet Coupons. Discover a more immersive media experience with the Dell Studio™ XPS™ 8100 desktop, designed to keep you front and center of all the action. Transform your screen into the ultimate entertainment empire with the new Dell Studio XPS 8100. This sleek and sophisticated desktop boasts new Intel Core i5 and i7 processors, 3D capabilities and stunning graphics options, and new THX TruStudio PC sound for enhanced music and movies with plenty of room for expandability. Its confident design will leave you speechless, while its powerful features will keep you coming back for more. Dive deeper into your media with enhanced graphics and hi-definition (HD) capabilities while condensing it all using a general-purpose graphics processing unit (GPGPU)-enabled graphics solution and optional CyberLink MediaShow Espresso. Watch your screen transform into life-like reality with standard ATI 4350 graphics or optional ATI HD 5770 1 GB GDDR5. 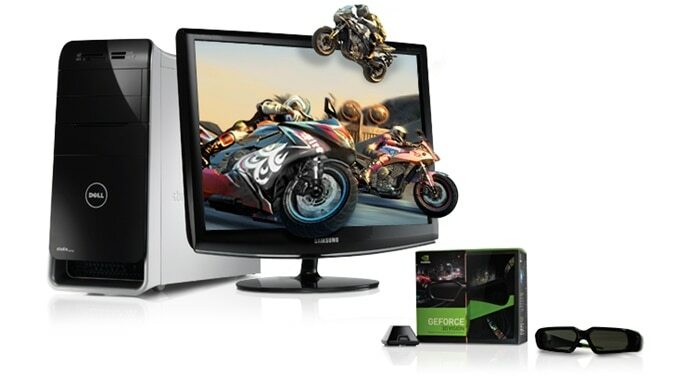 Choose from NVIDIA® GeForce® GT220 or NVIDIA GeForce GTS240 and NVIDIA GeForce GTX260 with 3D* capabilities. Enjoy HD imagery and world-class performance with lightning-fast video and image processing. And for a more intense gaming experience, accelerated PhysX™ gaming effects provide a dynamic, larger-than-life impact. Convert your movies and other large HD content to a smaller size with optional CyberLink MediaShow Espresso paired with a GPGPU-enabled graphics solution. Scale down content to fit devices such as MP3 players, mobile phones or whatever digital device you own, so that you can take your favorite media wherever you go. Optional CyberLink MediaShow Espresso offloads the most intensive processing tasks from the processor to the graphics processor for quicker transcoding of your media content — taking care of all the heavy lifting. THX TruStudio PC sound enhances music and movies, making them sound livelier — voices and dialogs are clearer, and changes in audio volumes are smoother — and providing a better listening experience and stunning sound. The Dell Studio XPS 8100’s sleek and streamlined design isn’t just for show — every curve and contour was built for convenience and durability. Its angled stature provides easy access from above, while its recessed media tray offers two convenient USB ports for your portable devices. The media card reader and power button are also located on the top for easy-reach access. And it doesn’t stop there. The new look of the Dell Studio XPS 8100 desktop is tailored in pure white with metallic silver accents. Equip yourself with a pair of stylishly modern active shutter glasses, a lightweight alternative to the traditional 3D glasses with adjustable nose pieces to fit over prescription lenses. And they’re fully untethered, giving you a free range of motion up to 15 feet through the wireless IR signal. NVIDIA software automatically transforms hundreds of PC games into a full stereoscopic 3D experience. Experience rich, immersive gaming with stunning realism supported by the latest graphics technology including NVIDIA PhysX, Microsoft® Windows Vista® and DirectX® 10. The new Intel i5 and i7 processors are designed for faster multitasking, digital media creation and gaming. When your most demanding applications need your attention, Intel® Turbo Boost Technology dynamically speeds up the processor frequency for an increased level of performance, ensuring your demands never go unmet. Go further without leaving your chair. Intel Hyper-Threading Technology maximizes performance with an eight-threaded capability on four cores, so you can multitask with greater efficiency than ever before. (Hyper-Threading Technology is only available with the Intel i7 processor). The dual-channel Dual Data Rate 3 (DDR3) memory offers a higher bandwidth than DDR2 that enables the Dell Studio XPS 8100 to work at a faster performance rate with increased responsiveness. It comes equipped with four dual in-line memory module (DIMM) slots for expandability — so as your needs increase, there’s always room for more. Our online backup service offers data protection by enabling customers to back up data to a safe, remote storage site using a broadband connection. Dell DataSafe Online is easy, flexible and secure. After setup, it will automatically back up data and help protect against software, hardware and catastrophic failure. Enjoy what’s on your home PC from almost anywhere. With Remote Access Basic, you can easily access photos, music, movies and more on your home system using another Internet-connected computer. No more waiting until you get home to get the files you need! Our centrally located, easy-to-use application provides personalized support resources. Conveniently located on your PC’s desktop with quick links to service, support and system resources. Helps keep your system up-to-date and running efficiently through automated fixes for common configuration issues. Resources and Shopping HelpNeed more info to make a decision? Let us help. ABOVE PRICES INCLUDE ANY APPLICABLE DISCOUNTS. Outlet systems are refurbished, previously ordered new or scratch and dent. Supplies limited to stock on hand. Offers subject to change, not combinable with all other offers. Taxes, shipping, and other fees apply. Limit 5 items per customer. Offer not valid for Resellers. Dell reserves the right to cancel orders arising from pricing or other errors. ^Dell Business Credit: Offered to business customers by WebBank, Member FDIC, who determines qualifications for and terms of credit. Taxes, shipping and other charges are extra and vary. Minimum monthly payments are the greater of $15 or 3% of the new balance shown on the monthly billing statement. Dell and the Dell logo are trademarks of Dell Inc.